PuffTheMagic has let the world know that version 0.3.2 of wIRC is out and if you haven't checked out this IRC client for chatting like crazy, it's time you did. A couple versions ago they switch the app to "hybrid," which means it uses both regular SDK code and native PDK code for a faster experience. This version brings Beta support for SSL, a must for people connecting to secure chat rooms (and on the short list of must-have apps for any smartphone OS for Engadget's Joshua Topolsky - we're not saying, we're just saying). You may also have missed the improved color support, event messages, and more that have come with recent updates to wIRC. Source: PreCentral Forums, WebOS Internals. 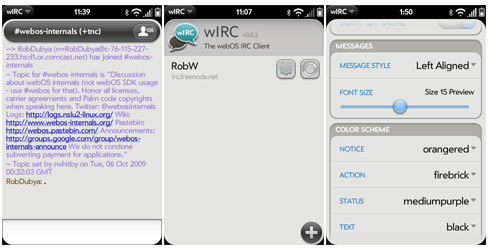 Consider Donating to WebOS Internals if you haven't yet!